Why Trust the White Christ? TO ENCOURAGE SCANDINAVIAN ENVOYS to accept baptism, Frankish emperor Louis the Pious gave the newly baptized a fine, white baptismal garment. In addition, Frankish nobles, who acted as the baptismal candidates’ sponsors, handed out other rich gifts. Such generosity naturally attracted many envoys, with awkward results. On one occasion (probably apocryphal), related by a ninth-century German named Notker, 50 potential converts arrived, and since there was not enough new cloth for so many garments, the sponsors made some from old clothing. The solution wasn’t acceptable to one elderly recipient. 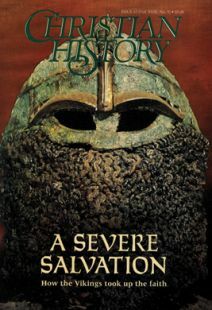 The story illustrates one motive for Vikings’ becoming Christians, but hardly the most compelling. In fact, the motives for conversion were complex, and they changed over three centuries of missionary work. Such “converts” as the elderly man above did little to advance the cause of Christianity. One Frankish archbishop complained that many converts reverted to pagan ways and were behaving “like typical Northmen.” Still, ninth-century Scandinavians who visited Christian Europe as raiders, settlers, merchants, or envoys must have been impressed by the enormous wealth and elaborate rituals of Frankish and British churches. So when Viking leaders came to terms with Christian rulers, they normally accepted baptism. These pagan kings also tried to maintain good ties to Christian leaders. In 864, for example, the Danish king Horik II sent gifts to Pope Nicholas I. Nicholas returned thanks but urged Horik to be baptized and to abandon the worship of idols. Horik and other kings were naturally reluctant to abandon traditional beliefs and rituals, but there was also a political factor: conversion by missionaries sent by the Frankish emperor could imply submission to the empire. Though ninth-century missionaries were therefore unable to convert rulers, they claimed to have baptized many people, including some of high status. They were, however, unable to establish bishoprics and churches, or ordain priests so that converts could be instructed. As a result, as Widukind (a tenth-century Saxon historian), put it, “The Danes had long been Christian but they worshiped other gods.” The comment was probably true of other Scandinavians. Had Viking kings accepted baptism, it would have made little difference, for at that time they directly controlled relatively small areas. Most Scandinavian power was in the hands of chieftains who acknowledged Danish kings as overlords but not as rulers who warranted religious uniformity. By the end of the 900s, the situation was very different. Christian evangelistic influence had spread dramatically. Missionaries said little about theological subtleties such as the Virgin Birth or the Trinity but concentrated on the power of a militant Christ who ensured success in this world and salvation in the next. They sought to demonstrate that their God was not just more powerful than other gods but was indeed the only God. All others were demons. That Christ had triumphed in the rich and fertile parts of Europe impressed many Vikings. Though many may have doubted Christ’s power after they disrupted churches, Christians merely explained Viking victory as divine punishment for Christians’ sins. Victories won by Christians were, in contrast, proof that their God was supreme. Miracles and the impunity with which missionaries and Christian kings destroyed idols and defied pagan taboos were further proofs of the power of Christ. Not until the 1100s did the concept of the suffering Christ take root in Scandinavia; before that Christ was depicted as a triumphant prince—even on the cross! By 954 the Danish conquests in England had helped create a united, Christian kingdom, and descendants of Scandinavian settlers had begun to build hundreds of churches. In Scandanavia itself, the new threat was not the Franks but the Germans. Harald Bluetooth converted partly to preserve his independence (removing one reason for conquest by the German emperor). Harald also recognized that Christianity had much to offer his rule. It not only exalted his status, but also provided practical help. Missionary bishops were literate, and those who had experience of royal government in Germany or England could be valuable advisers. Other parts of Scandinavia were not so vulnerable to external pressure. In Norway the growth of royal power was closely linked with conversion. The kings traditionally associated with Norway’s conversion and unification (Hakon the Good, Olaf Trygvesson, and Olaf Haraldsson) all had firsthand experience of English kingship and understood the advantages enjoyed by a Christian monarch. What runestones and graveyards reveal about the Vikings’ conversion process.